The body needs a variety of the following 5 nutrients - protein, carbohydrate, fat, vitamins and minerals - from the food we eat to stay healthy and productive. 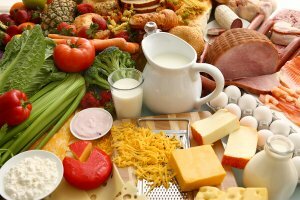 Protein - is needed to build, maintain and repair muscle, blood, skin and bones and other tissues and organs in the body. Carbohydrate - provides the body with its main source of energy. Vitamins and minerals are needed in very small amounts and are sometimes called micronutrients, but are essential for good health. They control many functions and processes in the body, and in the case of minerals also help build body tissue such as bones (calcium) and blood (iron). Sell food products on Export Portal, build your brand on the biggest eCommerce platform with a large catalog of international goods and amazing service. Purchase food products on Export Portal, get the products right from the manufacturer, avoiding thousands of retailers and extra payment.